Local Directions: From I-17 Northbound: Take Exit 289. Turn left on Montezuma Castle Road. Continue onto West Middle Verde Road. Turn left into Distant Drums RV Resort. FROM I-17 SOUTHBOUND: Take Exit 289. Turn right on West Middle Verde Road. Turn left into Distant Drums RV Resort. Passport America 50% PA valid for 1 day a month. Not valid March-May, September-November, on the pull through sites or the large motorhome sites. Must mention P.A. at time of making reservation. Not valid on online reservations and for groups and rallies and on rentals. We stayed in site 91 - back in full hookup site. It was concrete, flat and wide. Sites are adequately spaced apart and all have picnic tables. There was no shade so it can get very hot in the summer. We didn't use the WiFi or cable. 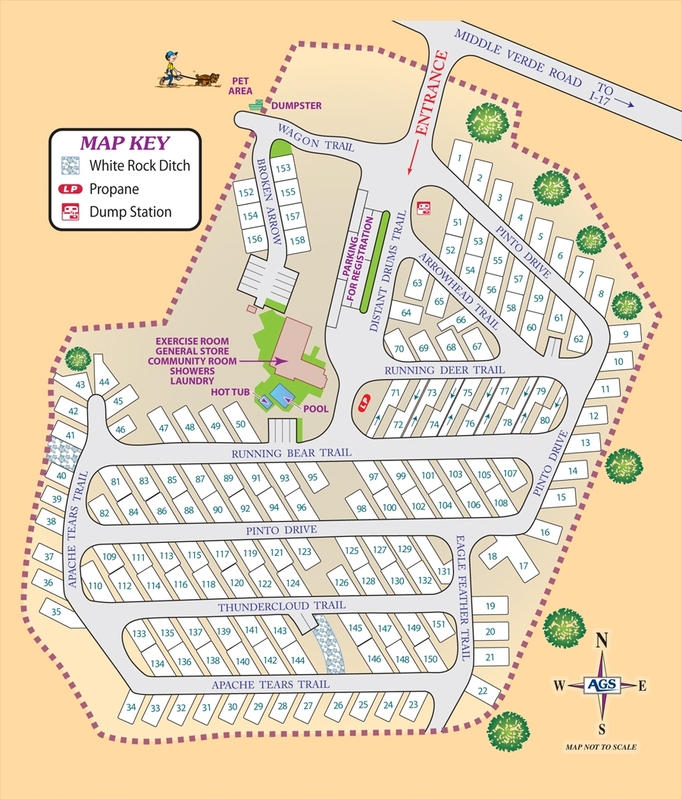 This is a modern well run resort - the staff were very friendly and it has a lot of great facilities - fitness center, big laundry room, library, swimming pool, hot tub, dining room and outdoor deck for BBQs. Shower rooms were large and private and available 24/7. 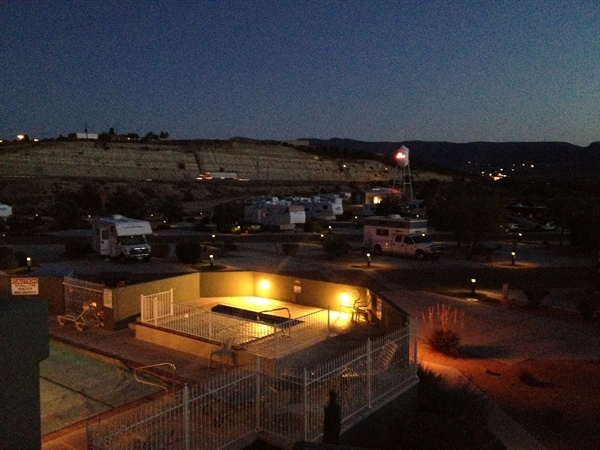 It is close to the I-17 so easy for a one night stay if you're passing through. 35 minutes outside Sedona, so I wouldn't recommend staying here if that is where you want to spend your time. However, if you're exploring the Camp Verde area I would recommend staying here. 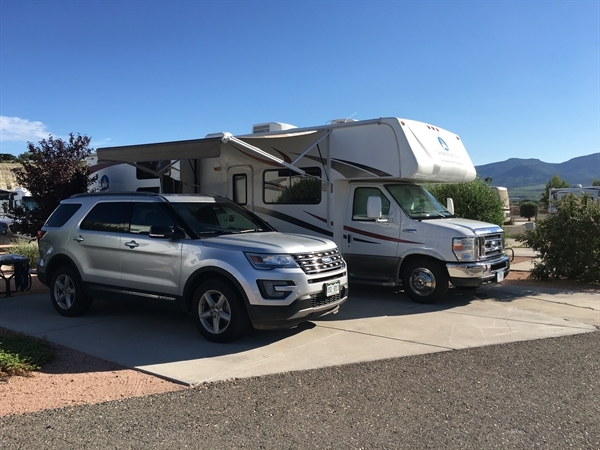 Short drive to Montezuma Castle NM and Out of Africa Wildlife Park, Fort Verde State Historic Park and V-Bar-V Heritage Site (petroglyphs). We didn't feel quite at home here. The staff were friendly and polite enough, though, and the park itself was comfortable. The sites were concrete, large and long enough, but definitely not level. Had full hookup sites with cable TV, but didn't bother with the wi-fi because it's not reliable, limited to only one device and usage is severely restricted. We didn't bother using the park's showers either because they're located at the office and they're only open during office hours. Other facilities are only so-so. Maybe we'll stay here again, but only if there aren't any other parks available. I have mixed feelings about Distant Drums. On the one hand, I like that it is a very clean park with amazing and friendly staff. They really go out of their way to make your stay nice and comfortable. The location is also great in that you can use the park as a base for visiting the local attractions. On the other hand, I have strong issues about the design of this park. Leveling was definitely a problem, for one. We had to drive our RV on boards and use leveling blocks as well. That was a bit of a deal-breaker for us. The park has full hookups and we got a site that has one, but the water pressure was too low. Cable and wi-fi are both available, but the wi-fi is sporadic at best. It's a beautiful and clean park run by friendly people, sure, but the glaring flaws are enough for us not to return here.